March 27, 2013, 8:01 AM · One of the most popular experiences at Walt Disney World is dining at its more than 250 restaurants. With four parks, more than 30 resorts, and Downtown Disney, you can find dining options for every taste and group. While you still can call 407-WDW-DINE for reservations, Disney has released My Disney Experience which allows guests to plan out their entire trip online -- including dining (and even attraction times for guests staying in selected resorts who get access to FastPass+). Making dining reservations online is a great option for all guests: both first timers and veterans. The website allows you to filter restaurants based on price, location, and cuisine, which allows first time guests to really get a visual idea of the reservation that is lacking over the phone. It also allows veterans to skip much of the fine print that is stated with every reservation (park admission is not included, etc). I hope to give advice that will allow you to get into the restaurants you want and find good alternates, if needed. 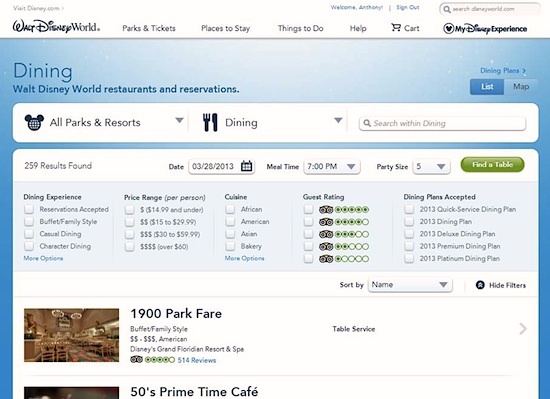 The dining reservation site allows you to filter under the following parameters: Parks/Resorts, Price, Cuisine, ratings (based on TripAdvisor.com), and Disney Dining plans. This is also the place to make reservation for the dinner shows and special dining events such as character dining. Many of the more popular restaurants require a $10 security fee which will be charged if you don’t show up. They do give you ample time to cancel so it shouldn’t be too much of an issue, but that's good to know. 1. Book Early: Probably the biggest tip that lots of guests miss, you get to make the dining reservation 180 days before the day you arrive. If you stay at a Disney Resort, you can start making reservations for the entire trip. Non-resort guests would need to wait at least 180 days before each day. As with everything with theme parks, the earlier the better! 2. Choose your date and time: If you know that you want to go for a fun lunch on Monday or a romantic dinner a Saturday night, the website allows you to filter down and show the only restaurants that have available seating at the date and time. I would suggest choosing a rough time instead of going with the Breakfast, Lunch, and Dinner choices. I find them very subjective and if your time is not available, they will give the next best time. Sometimes this is only a half hour off. 3. Choose your location: If you know you are going to Epcot or another park, just put that information into the filter and it you will see all the dining options available around that time. This is especially helpful for Epcot, which has the most restaurants that take reservations. 4. Check for events: Depending on when you go, there might be special events going on at the parks. While these are usually not to miss, they tend to make reservations a bit tougher. This is mostly at Epcot, but is usually on the weekends. This is a good tip to avoid crowds too. 5. Keep checking back: Don’t see the restaurant available on the day you want? Keep checking back to see if there is an opening. Many reservations change so there is usually a good possibility that there might be an opening if you are persistent and keep checking. Magic Kingdom: Quite possibly the toughest in-park dining reservations to get because this park has two of the most requested reservations in all of the Disney Parks: Cinderella’s Royal Table and Be Our Guest restaurants. If you request them on the first days you can make reservations, you usually can get them. Cinderella‘s Royal Table is prepay so it is important not to miss this reservation. Magic Kingdom does have some other excellent alternatives including Liberty Tree Tavern, Crystal Palace (good character dining for older kids and adults), and Tony’s Town Square Restaurant. Epcot: As mentioned, this place has the most restaurants that take reservations. I would suggest looking at selections early just to give you more options. The only restaurant that is notoriously crowded is Le Cellier. If you really want to dine at a steakhouse, I would highly recommend Yachtsman Steakhouse at the Yacht Club Resort. Another great find is the new Hacienda de San Angel (Mexico). We try to get the 8:15 reservation so that we can watch and listen to illuminations (the restaurant is right on the lagoon with huge windows and music played inside the place). Lunch usually gives you the most options for reservations. Lunch usually is less expensive and offers specials. Our usual “go to” restaurants that are usually walk up or easier to get reservations are: Nine Dragons (China) and Biergarden (Germany). Epcot also has princess dining in Norway which is a good alternative to Cinderella’s Royal Table at the Magic Kingdom. Plus Mom and Dad can get an “adult beverage”. Disney’s Hollywood Studios: Advanced reservations are not usually needed. If you know the date you are going to DHS, book a reservation. I recommend 50’s Prime Time Café or Sci Fi Dine In. Hollywood and Vine Character Dining is here and is a very popular option with Disney Junior aged kids. Walt Disney World Resort Hotels: Many resorts offer great dining options which also include Character Dining and Dinner Shows. We try to stay away from the Magic Kingdom Resorts because reservations tend to be tough. One of our favorites near there, though, is the Hoop de Doo Revue at Fort Wilderness Resort. It is all you can eat (and drink) with live singing and dancing. If you have teenage kids (or no kids), Hoop-dee-Doo revue does have an 8:30 show that is usually less crowded, less expensive, and a little looser (the jokes are a little more suggestive, but still PG). The other great area to check from restaurants is the Epcot area. Many do not know, but there is a secret entrance that connects Epcot to the Beach Club and the Boardwalk. In fact, you can take a boat directly from Epcot to these resorts. They are full of some of the best kept dining secrets and reservations are usually not too difficult. These places also make a good alternative to Epcot if it is full. Dining is a big part of the Disney experience, but make sure that you enjoy the food and have fun. Disney World has many dining options that allow you to experience the ambiance, food, and time with your family. Feel free to leave questions and comments in the section below. I would love to hear about your dining experiences! 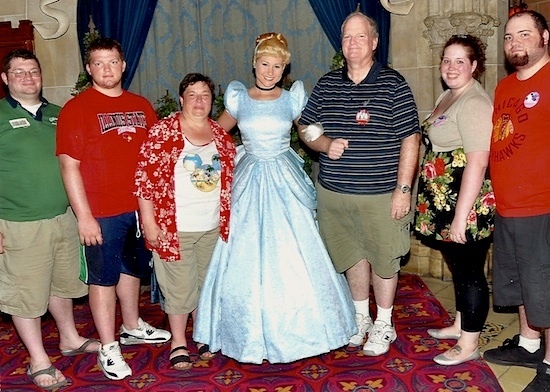 March 27, 2013 at 1:49 PM · I feel that Disney dining is overrated. For the same food served outside, you're paying up to 50% or more for the Disney experience. Certainly, there are some great experiences, thus I advise to not miss one or two dining experiences, but you're not going to die if you don't have any. Instead of breaking the bank for a "must have" Disney table service, why not do a side excursion or show? March 27, 2013 at 11:41 AM · Excellent article Anthony! I can't tell you how many folks ask about how to make reservations and why it is important to do so as soon as possible. I too think that booking the dining online is the way to go. March 27, 2013 at 4:38 PM · I am glad people like the article! Big groups do really need advanced reservations. One thing I noticed was that each restaurant appears to have a "max reservation" meaning if your party is over a certain number, you need to call the restaurant directly. I believe they gave a really high number (like over 20). Ohana is a great option, especially for big groups, but my family tries to stay away from the Magic Kingdom resorts. I guess its the age of our group. Disney food is overrated? I understand the cost problem. My family has gone "off grounds" multiple times and besides the Ale House, the rest of the options are chain restaurants. That's why we also usually skip Rainforest Cafe. There are three in the Chicagoland Area. What do people think about the dining options? March 28, 2013 at 5:46 AM · Nice work, Anthony, comprehensive and helpful! At Magic Kingdom an overlooked gem (IMHO) is the Plaza Restaurant. Reservations are not hard to get and the food is underrated. Plus, you can feed a family of five for less than $80 including dessert. Not bad for in park, full service dining. At Epcot, you did well to point out the nearby Boardwalk area. Just a short walk away you can take a break from the crowds, relax, and grab a No Way Jose at Beaches N Cream! I second your Prime Time Cafe choice at DHS. Food is good, service is fun, and the prices are decent. At DAK, the Yak & Yeti counter service area is a great deal. You get sit down quality food at quick service pricing and speed. Above all, and as you stated, folks should never forget that dining at the resorts is generally easier and better than dining in the park. Taking a midday break and heading to a resort for food is one of the best ways to keep your hungry family happy, healthy, and harmonious! March 28, 2013 at 7:42 AM · This is a well composed how-to guide. Personally, I find that we typically condense or combine meals unless we're on the Disney Dining Plan, so unless we have table service credits to use, we only usually will book one table service meal during a week-long trip. Leaving the parks and travelling off-site for a meal can be quite a hastle, especially with kids. It's not as easy as it sounds, and if you're paying $70+/day to be in the parks, it's difficult to validate the time (2+ hours) to leave the parks midday for lunch that would probably take less than 30 minutes in the park for counter service or around an hour for table service. Also, while many people recommend leaving midday with kids to go back to the hotel to take naps, many don't consider the actual nap time that would need to be added to lunchtime. A midday nap with lunch off-site could consume 3-4 hours depending on where you go and how long your kids need to nap. That's up to a third of the time that the parks are typically open each day, so if going off site to eat maybe saves you $20 for a family of 4, you're losing valuable park time for an incremental savings. For DHS, I'd also recommend making reservations at their table service restaurants with the Fantasmic! Dinner Packages. The package gives guests reserved seating in the stadium, and can save as much as 30+ minutes that you would ordinarily need to stand in line to get a decent seat for the show. I do like the new online reservation system (very much like Open Table), but I feel that some of the more exclusive experiences can be difficult to find if you don't know where to look. Also, the website is still a little clunky and can be slow to load, causing some guests to miss very popular ADRs because the site gets slammed. I'd also like to give a little publicity for the WDW buffet restaurants. Many people think they're just food troughs for the obese, but I've found that many feature some really interesting dishes and are relatively well maintained considering the circumstances. I would rate most of the WDW buffets well above the average Golden Corral, Ryans, or Sizzler (if they still exist). For guests on a budget, the buffets offer a meal to fill up so you can just get snacks and small counter service items while in the parks. April 1, 2013 at 5:16 AM · #6, keep checking back, is a great tip for everyone! Better yet, give them a call! On our last trip, we tried to make a reservation one particular morning for 1900 Park Fare but there was nothing available. We checked again on the day of, still nothing. My wife called up and they said to come on over and they could squeeze us in. Sure enough, we got there, waited all of 3 minutes and suddenly our group of six was sitting at a table, eating delicious breakfast food and posing for pictures with the characters. So in short, when all else fails, pick up the phone!